Oh, Jeff, that was a most exciting set of posts!! Can I copy and paste them to a Word Processor so I can keep them for eternity and be able to make sense of the imeline which at this point I am totally lost? On behalf of Jeff I say yes you may, but only if you promise to read it very slowly so this way can follow along. 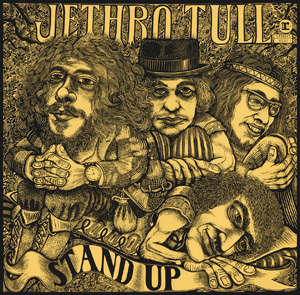 Where you from Kerry Lynn and how did you get into Tull? Wasn't we thinking of releasing these in audiobook format? That's right. I believe Jeff just worked a deal and it will be released shortly on 4 cassette tapes. Kerry will be able to purchase and savour these in the comfort of her peeps home. BTW, are we giving away Martin's new CD with Jeff's audio book? We hope that the winning entry will be judged by panel comprising a well-known guitarist and a one-legged player of wind instruments. The judges decision will be final. Along with Simon Cowell I hope. The more things change - the more they stay the same, nice to know Ian is still being Ian. Mr Anderson only one of these two identities has a future, and it's great to see how popular Jethro Tull still is today. I've loved the group since I first heard "This Was" round at a friends house more than 40 years ago. I got the group then and it's nice to see nothing changes. Keep up the good work, Ian (even the albums the critics hated are brilliant if you listen to them in the correct frame of mind (alcohol doesn't hurt this perception one bit).